In the last piece I wrote for this blog, I offered some reflections upon retiring from a 45-year career as a Goodwill Industries executive. In this piece, I will write about how that career began. I joined Goodwill four years after I graduated from Georgia Tech with a degree in Industrial Engineering. However, if anyone had told me then that I would spend all but a few of the next 50 years working for Goodwill Industries, I would have considered them delusional. Yet, I cannot imagine a career that would have been a better fit for someone who’s wired the way I am. Most successful careers are not planned. Peter Drucker put it this way: Most successful careers are a result of understanding what your values are, what you’re good at, what you’re not good at, what kinds of situations you work well in and what kinds of situations you don’t work so well in. Then you try to find a fit with all of that. That’s not necessarily easy to do and sometimes it comes only after a succession of not-so-good experiences. But a good fit can also come from being open to possibilities you never really thought about before – perhaps as a result of a part-time job, a volunteer experience, or just by getting to know people with backgrounds and experiences different from yours. And then, when you do find a fit that seems promising, you continue to learn as much as you can through whatever means you can. The results can be tremendously rewarding in a number of ways. At least, that’s been the case with me for over four decades. My career path started with a volunteer experience. Two years after I graduated from college, I was living in Washington D.C. while completing my military commitment. I was single, had a lot of free time, and attended a church that was heavily involved in community service. Every Saturday morning, they had a two-hour program for children with disabilities. Nearly all of the kids lived in low income households, and they relied on the church for transportation. I volunteered, and every Saturday morning I went to the homes of some of the children, picked them up, took them to the church, then took them back home again. They were great kids, and I got a lot of satisfaction from doing that. The church also offered a tutoring program on Thursday evenings for teenagers who lived in low income neighborhoods. I volunteered and for more than a year I tutored two boys 13-14 years old, one-on-one. I had never done anything like that before, and I got so much satisfaction from the experience I started wondering if I could find a place where I could use my industrial engineering skills, get a similar kind of satisfaction, and get paid for it. I called several not-for-profit organizations that were headquartered in the Washington area, described my background, and asked them if they had any jobs for someone like me. Goodwill Industries was one of those organizations. That initial conversation turned into a six-month process that included numerous meetings with national Goodwill staff and several Goodwill CEOs, interspersed with visits to two local Goodwills and a Goodwill convention. After much procrastination, I eventually decided to enter an executive training program offered by what is now Goodwill Industries International. It meant taking a 25% pay cut, accepting the lowest of three job offers I had at the time, and making a four-year commitment to work in a field that was totally foreign to me and that certainly carried no prestige with it – at least not in those days. I was 26 years old at the time. The decision to go to work for Goodwill was the hardest decision I’ve ever made in my life and was, at its core, a faith-based decision. Simply put, I believed this was what I was supposed to do. Over the past forty-five years, that belief has been confirmed in ways I never would have imagined. The “farewell” tour I’ve made during the months leading up to my retirement has been one of the highlights of my entire career. Listening to the stories and hearing the comments of hundreds of employees and students, I’ve never felt better about the organization – our people, our culture, and what we are doing. 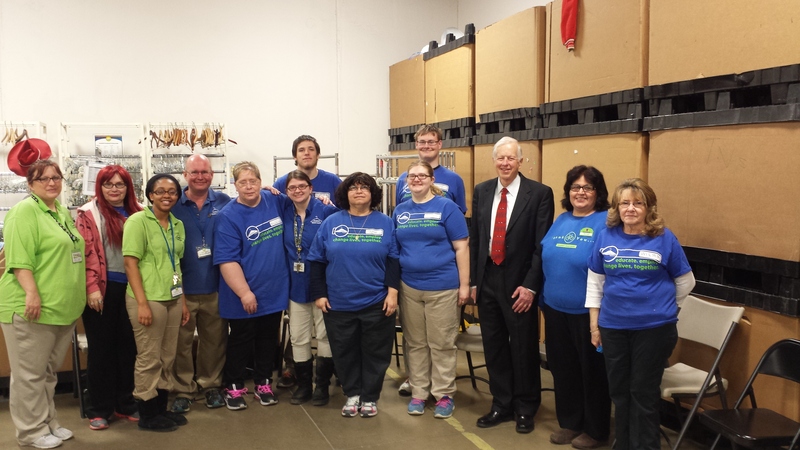 There’s no doubt that the impact Goodwill is having is far greater than ever. The way we are linking services internally and with other organizations in a holistic, multi-generational approach is, I’m confident, going to have lasting impact and help begin to reduce some major social problems. And yet, there’s so much more that needs to be done. 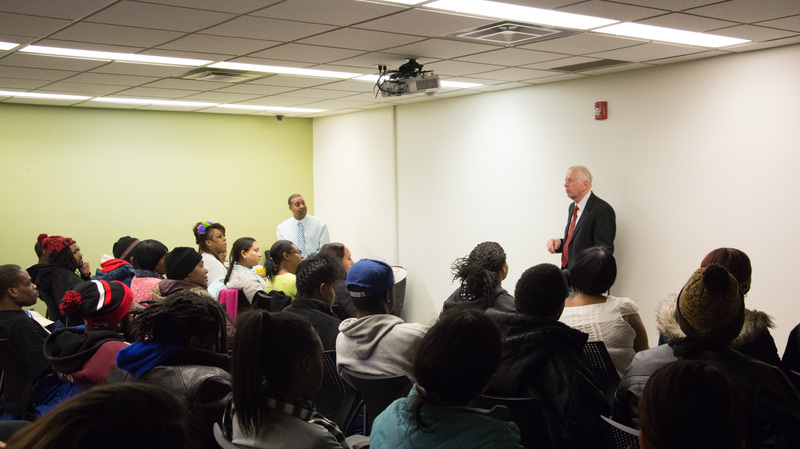 My career has been a constant learning and growing process, but the learning really began accelerating in 2004 when we became directly involved in public education by opening the Indianapolis Metropolitan High School. Continue working vigorously to raise education attainment levels, and we must ensure that at every step along the way we’re preparing students well for what comes next. Greatly increase the number of affordable, accessible, high quality early childhood development opportunities for children in low income households. Because of the way the brain develops, the years 0-3 are even more important than ages 3-5. The earlier we start, the better. In addition, to break a cycle of poverty, we need to take a long-term, holistic, multi-generational approach that leverages the resources and capabilities of multiple organizations within and across the sectors in focused ways designed to prevent problems, help kids develop, strengthen families, and make much more effective use of existing resources. Goodwill in central Indiana is taking such an approach with a growing number of families and organizations, and that approach is attracting a growing amount of national attention. But while others can learn from our experiences, we must also continue to learn from others. And while Goodwill’s board of directors and new CEO, Kent Kramer, will determine the organization’s direction going forward, there’s a strong base of knowledge and experience to build on and a lot of resources that can be deployed to further increase impact. I don’t know what the organization we’ve built will look like ten years from now, but I know it will be different. Goodwill must continue trying new ways to grow its businesses and accomplish its mission; it must continue to learn; and it must continue to adapt as the world around it changes. Yet while I can’t predict what the organization will look like a decade from now, I do hope to be around watching from the sidelines, and I fully expect to be amazed! With my retirement date rapidly approaching, I have been spending a good bit of time on a “farewell tour” of our stores, schools, and commercial services sites to thank our people for helping make the organization what it is today and to wish them well. I’m now two-thirds of the way through that tour, and listening to the stories and comments from many of our employees and students has been incredibly uplifting. A young woman in one of The Excel Centers told me she has severe autism and this spring will become the first person in her family to graduate from high school. A Goodwill retail store employee who is an alcoholic told me he had lost everything and no one would hire him – no one, that is, except Goodwill. We’ve employed him for five years, and he does a great job. He said, “Goodwill gave me a chance for a new life.” And he’s made the most of the opportunity. Another employee told me that when she was hired by Goodwill she had no place to live, no car, no money, and no future. She is now an assistant store manager and is nearing completion of requirements for a bachelor’s degree in business. She definitely has a future. A regional director took a personal interest in a store employee after she suffered a devastating personal experience. He saw to it that she got the help and support she needed to put her life back together, and she has since been promoted. Finally, many of the staff in The Excel Centers, stores, and distribution centers have told me Goodwill is the best place they’ve ever worked. Organizational culture can be fragile. From my observations, ours is deep and ingrained at every level. It exemplifies what Goodwill is all about as we strive to provide opportunities, maximize positive impact in the lives of people and the communities where we operate, and still maintain a financial position that enhances our long term viability. That’s not easy to do, but our people seem to always find a way. The organization I lead now has over 3,200 employees, two-thirds of whom have limited options because of a disability, criminal history, low education level, or other significant barrier. And while there are a lot of part time employees among those 3,200, nearly half of them are the primary source of income in their households. That places an enormous responsibility on those of us in leadership positions to run the organization really well so we can continue to provide a livelihood for all those people who are counting on us. And we don’t take that responsibility lightly. What we do matters. If we’re not paying attention to what’s going on around us and we allow ourselves to be blindsided, it matters. If we become myopic, complacent, or arrogant; if we fail to take care of our customers; if we fail to recognize what our competition is doing or fail to see new competitors or new forms of competition that are emerging, it matters. If we don’t successfully adapt to changes in our environment – changes in technology, demographics, the legal or regulatory landscape, or the larger economy, it matters. Even worse, if we cut corners, act unethically or illegally, take actions that might benefit us in the short run, but that will eventually result in long term damage, it matters tremendously. How we go about our work matters just as much as the work itself. And all of these things matter to a lot of people who are likely to lose their jobs if those of us running the organization aren’t doing our jobs as well as we possibly can. And if we let that happen, we should and probably will lose our jobs, too. On the other hand, if we are paying attention to what’s going on around us; if we’re recognizing opportunities, trying new ways to grow our businesses and accomplish our mission; if we are operating according to high ethical standards; if we’re continuing to learn and adapt; if we’re being good stewards of our resources; and if we’re treating everyone with respect and providing the kind of workplace and culture that enables our people to grow, we’re likely to see our organization grow, evolve, and employ more people. Fortunately, that’s been our recent experience, as we’ve added over 1,000 jobs in central Indiana and increased our revenue by 55% in the last five years. Of course, our experiences haven’t always been that positive, and no employer can guarantee that any job will last forever. Changes in our external environment are occurring at an incredible rate and require near constant adaptation. Along the way, some jobs disappear while others are created. Some people learn and adapt to changing circumstances and requirements, others don’t. Our approach is to do the best job we can to grow the organization in a financially responsible manner while simultaneously increasing our mission-related impact. In addition, while recognizing that each of us is primarily responsible for continuing to learn all our lives, as an employer, we are often in a position to help our people learn and grow, improve their education, and earn credentials that enhance their future employment prospects. Then, if circumstances beyond the control of an individual result in the loss of a job, at least the person affected is likely to be better prepared for his/her next step than might have been the case otherwise. In my opinion, when a company is operating in a manner that enhances the prospects it will be able to continue providing a livelihood for its employees, and when that company is doing all it can to help its employees learn and grow, it is exercising what might be considered its most important corporate social responsibility. 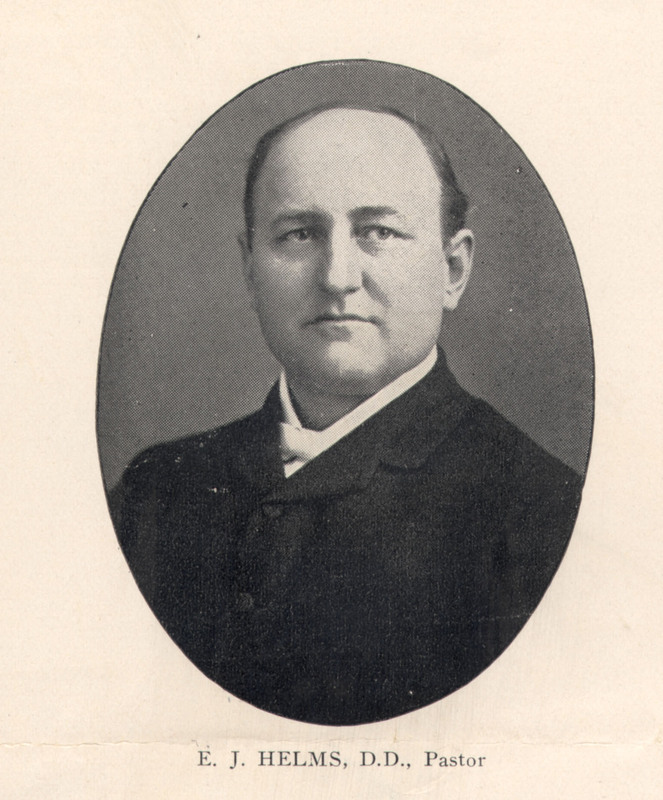 January 19, 2015 was the 152nd anniversary of the birth of Edgar Helms, the founder of Goodwill. At the beginning of the 20th Century, he came up with an idea that included asking people to donate clothing and household items they no longer wanted. Helms wasn’t the first person to do that. But instead of just giving those goods to poor people, he put unemployed people to work collecting and repairing some of the goods, selling them to the public, and using the money to pay wages to the workers. He created jobs – a way for unemployed people to earn money, and the collection and sale of used goods was the means to that end. That basic idea still works over 100 years later and represents the financial backbone of our entire organization as well as a source of a lot of jobs – over 2,000 in central Indiana alone – for people who in many cases don’t have a lot of options. Helms believed that every human being has value, and he believed in giving people opportunities – a chance rather than charity – a hand up rather than a hand out. And those basic values are still just as important in Goodwill as they were over a hundred years ago. We do things differently today, to be sure. Over the course of our history, we’ve continued to learn and to adapt to the incredible changes that have taken place in the economy, demographics, technology, laws and regulations, competition, and American culture. I believe Helms would be amazed at how large Goodwill has become across this country. 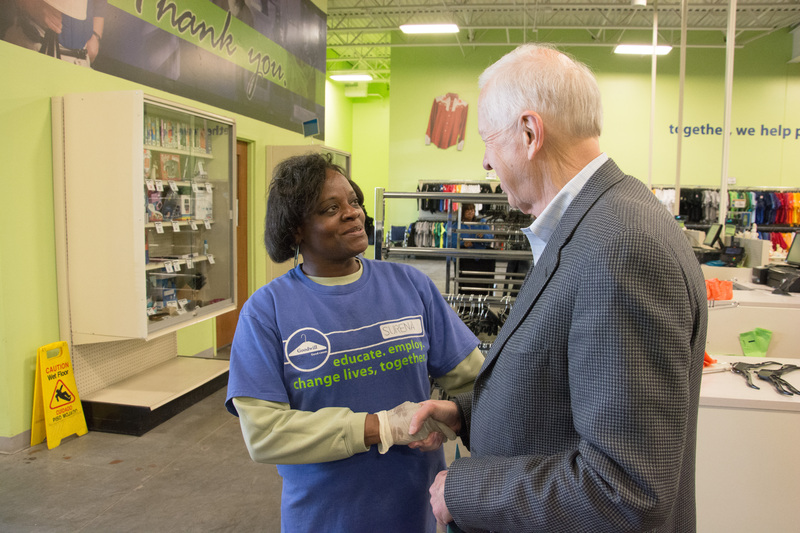 And I believe he would be particularly pleased to see how Goodwill in central Indiana has evolved – especially over the past decade – because of the way we are emphasizing whole person, often whole family approaches. Such approaches haven’t been all that common among Goodwills over the past half century. But that’s the approach Helms took in the early decades of Goodwill’s history. 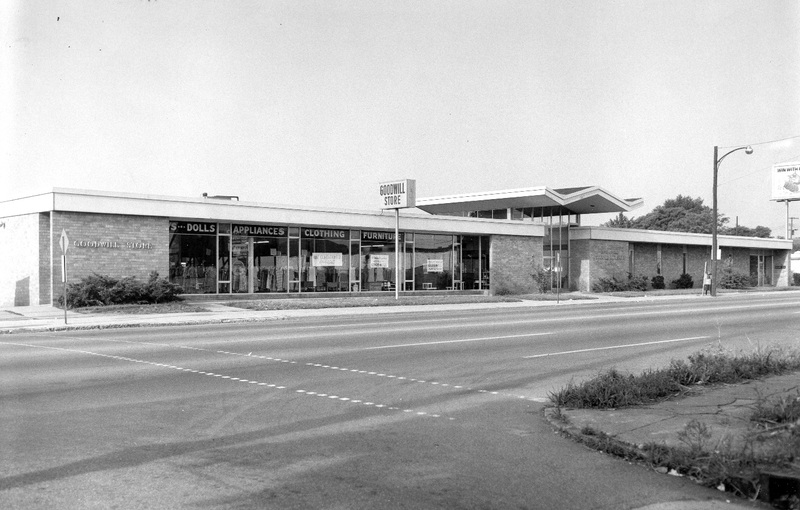 That first Goodwill, located in Boston, included a day nursery, a kindergarten, a fresh air camp and farm for city kids, a music school, and a night school that taught trades. Of course, they also offered employment services and jobs. The other early Goodwills followed that lead and included a similar emphasis on helping families. For example, in the late 1930s, the small Goodwill organization in Indianapolis, working with other organizations in the community, offered a kindergarten, a prenatal clinic, a dental clinic for school children, a home-based health care program, a variety of classes for female heads of households, and a library with books mothers could borrow to read to their children. From my reading of the organization’s history, that approach began to change in the early 1940s as providing jobs became the primary or exclusive focus. For the next forty years, our principle role in the community could be paraphrased as helping people with various employment barriers prepare for, find, and keep jobs. During the last decade, though, in response to some significant changes in our society and the inability of other approaches to solve a number of major social problems, we’re now moving back toward a much more whole person, often whole family approach much like that exhibited by Goodwills in the early part of the 20th Century. In a sense, we’re coming full circle. Today, though, with current information and technology, along with other resources, we have the potential for much greater scale and lasting impact in the lives of people and the larger community. 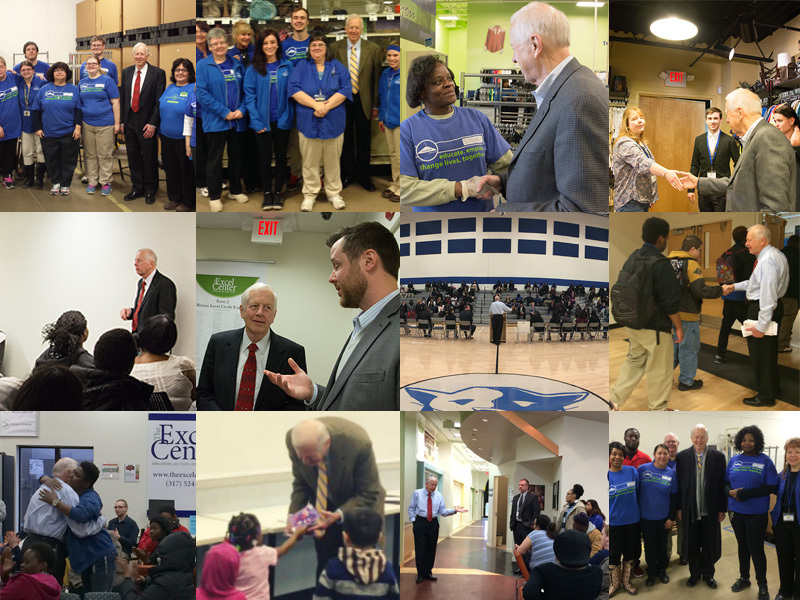 From a personal standpoint, what we’re engaged in today is the most significant and exciting work in my 45-year career with Goodwill.